The Saskatchewan Roughriders became difficult to stop when Brandon Bridge finally settled in at quarterback. The Mississauga, Ont., native started the third straight game for Saskatchewan and took most of the snaps against the Hamilton Tiger-Cats at Tim Hortons Field on Thursday night, rallying the Roughriders from a 17-7 first-half deficit to a 31-20 win. Bridge finished the night with 17-of-22 pass completions for 165 yards and one touchdown. That wasn't the game plan going in, though. Saskatchewan head coach Chris Jones planned to continue what he had been doing since Zach Collaros went down in Week 2 - switching up quarterbacks between Bridge and backup David Watford as the game necessitated. In Saskatchewan's last game, at home against Hamilton, Jones changed between Bridge and Watford drive-to-drive six times. This time, it was Bridge's game, save for Watford's 2-of-3 passing for 13 yards. Jones said Bridge looked comfortable and he didn't see a need to make the switches. 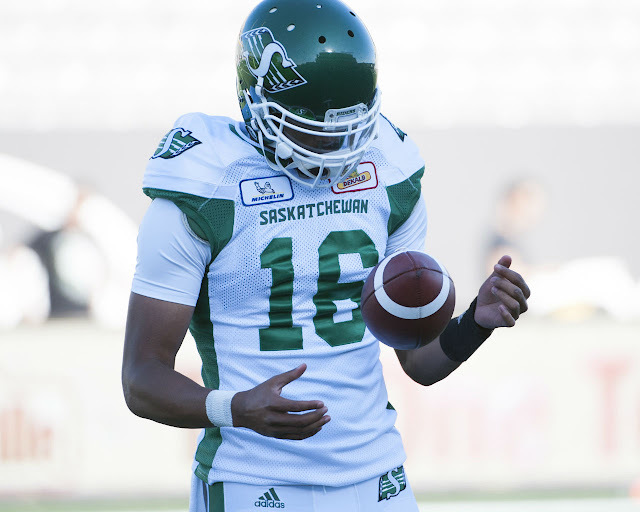 In the first half, Bridge completed 8-of-12 pass attempts for 82 yards and the Roughriders were down 17-7. But he was near-perfect in the second half, completing 9-of-10 attempts for 83 yards and one touchdown, a 24-yard pass to Naaman Roosevelt. It was Bridge's first TD pass of the season. Bridge said he felt like he was in a rhythm, especially after the TD pass. That's when Bridge figured the game plan would change. Both teams return to the field next Saturday. Hamilton hosts Ottawa while Saskatchewan welcomes Calgary. Is Collaros even at the practice field these days? Is he done? 4 weeks now since the injury. Zero updates. It comes down to one thing. Improved play from the O line. Bridge has the ability when given the protection. Mix in a run game like they just had and they’re in good shape. When you are on the 6 game you aren’t allowed anywhere near practice.